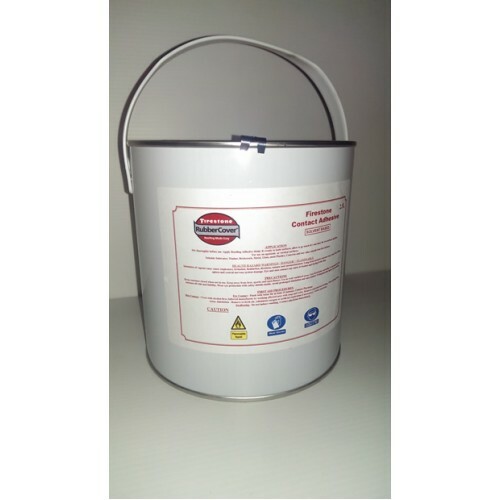 Firestone Bonding Adhesive BA 2004 is a neoprene based contact adhesive designed for bonding EPDM membranes to wood, masonry, metal and other acceptable substrates. Surfaces on or against which Bonding Adhesive is to be applied must be clean, smooth, dry and free of sharp edges, loose materials, oil, grease and other contaminants. The mating surface of the membrane shall be cleaned with a brush or clean rag. Stir the adhesive thoroughly before and during use, achieving a uniform mix with no sediment on the bottom and no marbling evident. Restore the adhesive to room temperature prior to use, if exposed to temperatures lower than 15 degrees for a prolonged period. Apply adhesive in an even, smooth coat on both surfaces with a solvent resistant roller. Avoid globs and puddles. Allow adhesive to flash off until tacky (time depending on ambient air conditions) prior to mating the surfaces. Test the adhesive for its dryness, using the push-touch test procedure as described in the installation guides. The Adhesive must be applied at a uniform rate to both the membrane and the roof substrate. Coverage rates depend on smoothness of substrate and method of application. Shelf life - 12 months, when stored in above-mentioned conditions.